Sometime in 1926, four years after Sri Bhagavan came to live at the foot of the holy hill beside the samadhi of the mother, Arunachalam Pillai of Kumaramangalam, near Gudiyatham entered the ashram with a cow and her young female calf and offered them to Sri Bhagavan in token of his devotion. Bhagavan tried to dissuade him pointing out there were no proper facilities at the ashram for looking after the cow and the calf. However Arunachalam Pillai was very adamant and even said that he was not interested in taking back the Cow and the Calf even if somebody were to cut his throat. 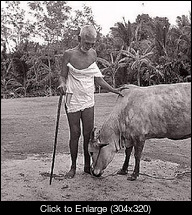 Seeing his insistence and the devotion behind it, one Ramanatha Brahmachari who was then living near Bhagavan declared energetically that he will take care of the cow and the calf. As the Calf came on a Friday, Maharshi named her ‘Lakshmi’. Ramanatha somehow tended the cow and the calf for two or three months. Lakshmi was very playful and she ruined all the vegetable plants at the Ashram. If anyone chided her, she used to go to Bhagavan for protection. Bhagavan used to tell the ashramites that they could put up a fence to protect their plants. Ramanatha could not put up with all these troubles form the other inmates of the Ashram and hence handed over the cow and the calf to one Pasupathi, a keeper of cattle in the town. Once the cattle keeper came to the Ashram along with the Cow and the Calf and then they went back. At that time Lakshmi saw the whole of the Ashram. Remembering the route carefully, she began to visit the Ashram from the next day onwards regularly. Lakshmi used to lie down by the side of Ramana’s Couch. If food was available she would insist that Bhagavan alone should give it to her. She would not take anything other than the hill plantain. Every day exactly at the appointed time for meals she visited the ashram dining hall and stand before Bhagavan which was a surprise for everyone including Bhagavan as there was no bell or any other alerting mechanism used to inform the meal time. Lakshmi’s arrival to the Ashram was the signal to everyone in the Ashram that it was time for meal. She then returned to the town in the evening most reluctantly. Lakshmi was pregnant for the third time and one evening she was unwilling to leave Bhagavan and go home. Bhagavan was visibly affected. Softly passing his hand over her face he said, “what you say you can’t go away. You only want to stay here? What am I to do?. Looking at the others, he said, “look Lakshmi is weeping, saying she cannot go away. She is pregnant and may have confinement at any moment. She must go a long distance and again come here in the morning. She cannot refrain from coming here. What is she to do?”. At last Bhagavan somehow coaxed her and sent here away. That very night she delivered. At about the same time Pasupathi had some domestic difficulties. Unable to bear the burden of this Lakshmi with all her vagaires, he brought her and her three calves and presented them to Bhagavan. Lakshmi lay at Bhagavan’s feet and would not rise. Placing his right hand on her head and pressing it, he asked if she would like to stay here permanently. She closed her eyes and lay still as if in a trance. Noticing that, Bhagavan pointed out to the others that she appeared as though her responsibility for her calves was over, for they had been placed in Bhagavan’s charge. Bhagavan himself once pointed out the sanctity of Lakshmi by saying, “what tapas she must have performed in her previous births! It may be that she is living in our midst now only to complete her unfinished tapas’. Lakshmi’s great devotion and the possessive way in which she would always approach Bhagavan, along with the great kindness and attention he showed her, convinced many of the devotees that there was some special bond between them. Many felt that although Lakshmi now wore the form of a cow, she must have attached herself to Bhagavan and won his grace by love and surrender in her previous birth. Many old timers at the Ashram believed that Lakshmi was reincarnation of an old lady by the name Keeraipatti, who had known Sri Ramana from his earliest days in Tiruvannamalai and had occasionally prepared food for him almost up to her death in 1921. It is believed that Lakshmi brought a lot of luck and prosperity to the Ashram, a fact that was mentioned by Sri Ramana himself. On the day of Lakshmi’s death (18th June, 1948) the Maharshi came to the cowshed sat on the hay by her side, lifted her head with his both hands and passed one of his hands lightly over her face and throat. Then placing his left hand on the head, he began pressing with the right hand fingers her throat, right down to the heart. After pressing like that for some time he said addressing Lakshmi, “what do you say, mother? Do you want me to stay here alone? I could stay but what to do? I must now go to the hall as the people there will be asking for me. But wherever I may be, I will never leave you. I will always be with you. You are all right” and after some time Maharshi went away. She then passed away peacefully and was given a ceremonial burial in the Ashram premises. A samadhi shrine built over the grave with the true to life statue which is worshipped by the devotees even today. An epitaph written by the Maharshi in Tamil verse confirms her nirvana. When a devotee asked the Maharshi whether the use of the word vimukti in the epitaph was conventional or it really meant nirvana, the Maharshi replied that it meant nirvana.